I finally put a stop to the restaurant fetish to complete a 1:12 scene in the Villa Sibi. It wasn't until after I had re-sized the images of this room that I realized my sleeve must have bumped one of the yellow Panton chairs off placement while I was hanging the pictures behind the couch. Shrug. The wood counter in the kitchen is another set of children's wood blocks from Voila or Plan (not sure which one because there's a huge tub of them in the family room and I stole them and ran before any little police could catch me). The sink and oven units are Theo Klein. 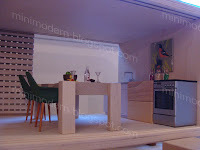 The dining table/island is from Selecta. The dining chairs are Reac. 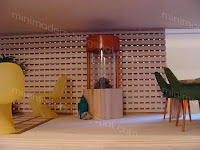 The fireplace is a combination of a modern fireplace from the Dolls House Emporium (item #3469) and a common wood block from the hobby store. The yellow Panton chairs are Bodo Hennig. The coffee table is Paris Renfroe (PRD). 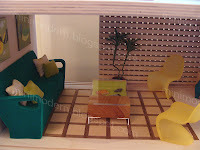 The couch is from Bozart Toys. The art is Charley Harper. The accessories are from Lundby, Bozart Toys, AG Minis, Lil Bratz, Mighty World and Re-Ment. I love this blog! 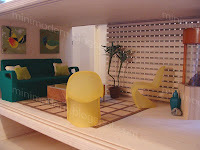 I have been searching the internet for miniature modern resources and I was so happy to find this one! Please continue with it, I love the scenes and pics, they give me such great ideas! I've only ever seen orange Bodo Hennig chairs before now. Or have they rereleased them? I LOVE the coffee table! Awesome room! On a side note - thanks for great art displays - The Charley Harper work looks fantastic and I'm thinking about a print for my real life abode . . . Thanks much! If you can, share pics of your modern minis with the rest of us. Modern miniaturists have to stick together. Smiles. They have released these Panton chairs under the Colora line in orange, yellow and blue. I love the coffee table too. All thanks to Paris Renfroe!! You know, I never knew anything about Charley Harper until I saw one of Todd Oldham's houses decorated with the art a couple of years ago. Great room. By the way, for those wanting modern dolhouse plans, I just purchased the Sunset Book from 1973 called "Things to Make for Children" from Abebooks for 3 bucks. 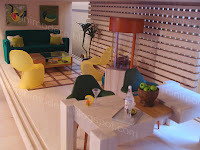 It has 5 amazing modern dollhouses plans with great pics. This particular book has the clown on the cover.